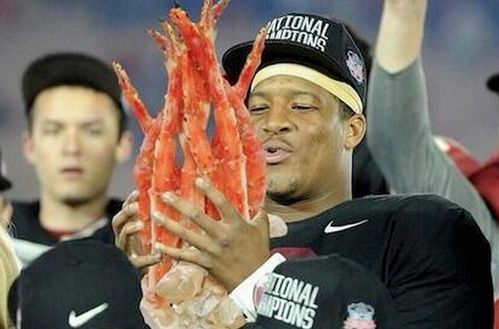 Heisman Trophy winner Jameis Winston was reportedly caught stealing seafood from a grocery store. Winston was issued a citation on Tuesday for allegedly trying to steal $32.72 worth of crab legs and crawfish from a Publix supermarket in Florida. According to Tomahawk Nation, Tallahassee Police cited Winston for shoplifting but he was not arrested. During a press conference, Leon County Director of Law Enforcement Michael Wood said Winston left the supermarket without paying for crab legs and crawfish shortly before 9 p.m. When police arrived at his residence after midnight Winston said he “forgot” to pay upon being interviewed. In a statement released through Winston’s attorney, Tim Jansen, he said, “I went to the supermarket with the intent to purchase dinner but made a terrible mistake for which I’m taking full responsibility. In a moment of youthful ignorance, I walked out of the store without paying for one of my items. Winston was suspended from the Florida State baseball team. He must also complete 20 hours of community service and pay a fine. Once Winston’s alleged stealing went viral, many poked fun at the quarterback on social media. Check out a few of the funniest memes below.